I love my Gold Seals so it was a hard decision. My whole life I’ve skated in freestyle blades with a similar profile: Coronation Ace, Gold Seal, and Reidell Eclipse. But I’m at the level where most ice dancers make the switch into dance blades, and the long tails on my Gold Seals were becoming a scary hazard. Ice dancing requires your feet to be very close together, “neat feet” as they call it. It’s easy to get your blades tangled together or step on the tail of a blade with the other blade. Those are nasty falls. I’d asked both my dance coach and one of my local skate techs, who is an Olympian in ice dance, what to do considering that I wanted to skate both dance and freestyle. Both thought I should skate on only one type of blade, not switch back and forth between two pairs of skates with different styles of blades. Both suggested a synchro blade as a good compromise. I have a massage therapist who is also a former ice dancer (don’t be jealous, now), and I’ve talked this problem over with her. I told her how I kept almost tangling my skates on the outside mohawk of the Fourteenstep, and she told me that she’d taken a bad fall getting her blades caught together on that very same step. That’s when she switched out of freestyle blades and into dance blades. 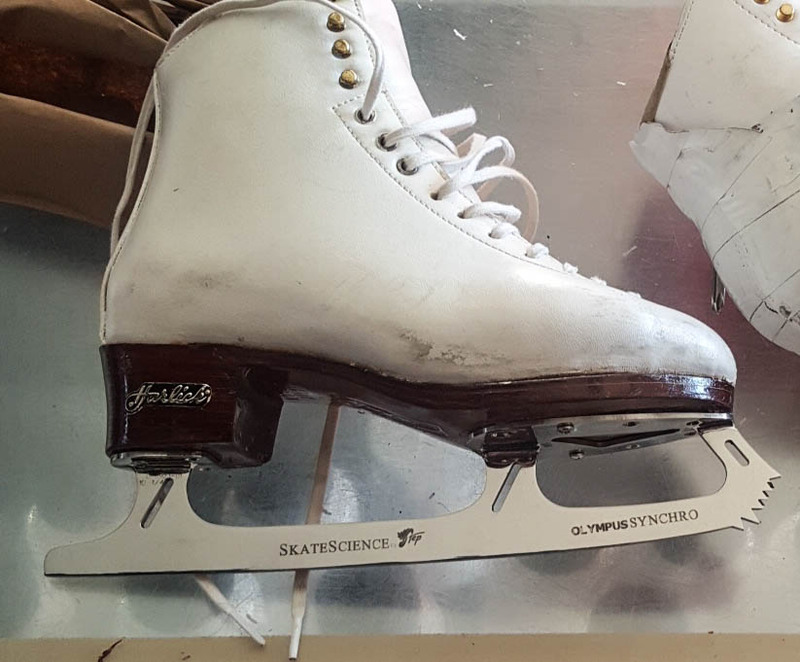 The Skate Science synchro blades are supposed to be geared 60-70% for freestyle and 30-40% for dance. They still have a decent toepick on them so you can jump, and they’re intermediate in length between freestyle and dance blades. I picked up my skates with the new blades last Tuesday and took them for a spin. To make things that much crazier it was my first time on the ice in three weeks. Did I really have to show up at the ice rink with just the skates and no padding whatsoever? The first ten minutes were really bizarre. I skated like a cautious beginner. 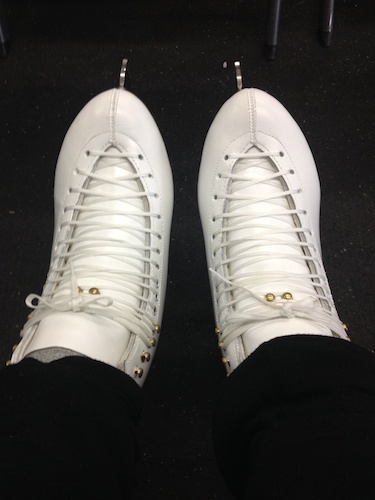 I’ve skated on them for a few hours now. I am going to be able to skate on them, but they are a lot different: the height, the rocker, the toe pick, the whole feeling. I can already tell that ice dance will be easier. I can bring my feet together without hesitation. With the shorter blade, it would actually take effort to tangle your skates together. I feel like I’m on top of the ice, whereas with the Gold Seals I felt much more in the ice. I’m not getting the same pressure and crunch and growl. I’ll have to ask my skate tech if he gave these blades a shallower grind or if that is just how they are. I seem to be getting a decent amount of speed and glide regardless, so maybe they are just quieter? The toe picks are quite different. Gold Seals have a big drag (first) pick, while these have a smaller first pick and a medium sized second pick. It makes a difference for jumping. The Gold Seals used to really launch me with that big first pick. With these, there’s a little delay from what I’m used to in getting into the air. Nevertheless I do seem to be able to jump fine. 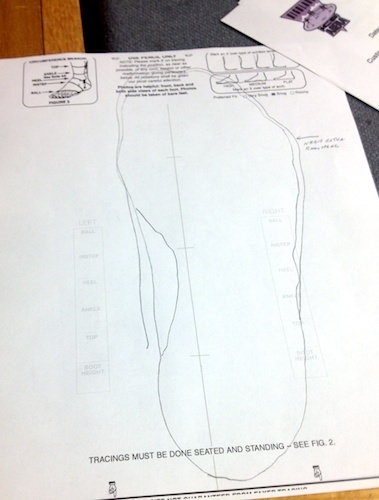 The toepicks, or maybe the rocker, is changing my three turns, the timing seems off. I’ve only tried to spin a couple of times. It’s different, for sure, between the different toe picks and the lack of the big spin rocker of the Gold Seals. And yet I can spin, it’s coming along and hardly worse than usual (I’m not a great spinner). I’ve already fallen hard off the shorter back end of the blades. No harm done, but I just ordered some new wrist guards. That’s my preliminary report, I’ll let you know how I like them after a while. Once I figure that out I can finally order the new skates I was fitted for back in January. Harlick Boots new out of the box! My new custom Harlick boots right out of the box. Cool, Mary! I heard that synchro blades give you the best of both worlds. I have been on dance blades for the past decade now, and have basically given up jumping (except for the occasional waltz jump and loop jump, but nothing off that toe!) Spinning is also more challenging, though I was working on them for a while a few years ago. Some of the difference you are feeling might also be that new rocker? That will really change how turns feel. Thanks for the update and I’m curious to know how the transition goes. I’m sure the new rocker is making a big difference. Spinning is more challenging in your dance blades, huh? I’m curious how it will eventually work out with these. I’ll keep you posted, I hope these really will be the best of both worlds. Great recap, Mary! I can’t wait to see how you like the blades after you’ve spent some more time on them. It will be interesting to see how and if your freestyle elements have changed. Yes, that will be interesting. I’m hoping for the best! I love to read about your passion for skating! Sounds like you have found a pair that is working well for you. Oh these are my old skates that have already been skated on for over six years, only the blade is new. Still TBD how the new blade will work out, though early signs are encouraging. This post reminds me so much of the agony we runners go through when we change shoes! I never realized there were different types of skates but it makes sense. I’m looking forward to reading how these new skates work out for you! This is just a new blade, not a new boot. And yes there are different types of blades for each discipline, as well as different manufacturers with slightly different blades within each discipline. Once I get the new boot you may hear about all kinds of agony! I am always amazed at the technology that is available for different sports, and how little changes can make huge differences! Very true Suzy! Skaters can have huge problems from a blade being off as little as a millimeter! This is so cool! I don’t know a lot of ice skating but I appreciate learning more about it through your blog. I had no clue that there were different blades but boots, but now that you mention it, it makes total sense! I’m glad you’re enjoying these details of the life of a skater! Interesting! I don’t know the ice skating “lingo,” so your posts are educating me 😉 I had no idea the blades were so different (based on each particular event), but it makes sense. Thanks for wading through it all. Mary: Thanks for the report. I’ve been wondering about making the switch to shorter tailed blades but I worry about falling backwards off those short tails. The Synchro blades seem like a reasonable compromise. For me it’s a big deal just going back to my old boots and free style blades when I occasionally go pond skating–blade feel is a big deal! Going back to the old boots and blades is a big deal! I worried about the same thing as you and was glad to hear of this compromise. The Gold Seals in particular have the longest tail of all the freestyle blades, so it was really a problem. The very cheapest skates are sometimes sold as one unit, but those are not a good kind to have. For intermediate and advanced boots and blades they are always sold separately. But there’s no reason you would have known that, it’s not a facepalm at all. Sometimes the boot will be broken down but the blade is still good enough to put on a new pair. Other times, like this one, there’s some reason to switch blades. You can only switch blades on a boot a very few times before it makes the boot structurally unsound. In this case my tech told me it was a one-way street, if I didn’t like the synchro blades he thought it would likely not be possible to switch back to the Gold Seals without destroying the boot. This is so out of my world but still so very interesting! I’ve always loved watching skating on TV, but that’s as far as it goes! There’s a lot more to skating than the winter Olympics every four years. I’m glad you found the post interesting even though it was a bit arcane, LOL. Ice skating is a beautiful thing! I’d love to skate more often but as a runner I’m always scared I get injured if I fall… Love how passionate you are about it!! Yes, I feel the same way about skiing. I can do it but I’d rather save my knees for skating. Wow! It’s crazy all the tiny details of a sport. Just like running shoes! Well… sort of. Lol. I haven’t had skates on in 25 years! Gina recently posted..UV Protection, Moisture Wicking, Mosquito Repelling! Every sport has its tiny details which make a huge difference! Thanks Clarinda! Early signs are promising! I know nothing about ice skates, but these look amazing! I ice skate very infrequently because I am too afraid to be injured. Yes, they are my custom boots which I like a lot. It’s wise to be cautious if you are a beginner. I recommend a helmet and full padding (wrist, elbow, knee) for beginners (not a bad idea for anyone really). A lot of people have the appropriate padding in their household already from rollerblading or some other sport. Changing anything that we use, whether its skates, shoes, etc. can always present us with challenges. It takes time to get used to something new, especially when we’ve been so used to something else. Very nice! Glad that you’re getting used to these.